Basic mistake, harsher: blunder. Secondary source Robinson on a secondary source Whitehead. Robinson is a fool, Whitehead a plagiarist. After all, if all of the history of philosophy is footnotes to Plato, that goes for Whitehead as well. d’Espagnat: in German, we call his quip Klugscheißerei. The crap spewed out by academics does not a history make, nor for certain is it philosophy. It is a “reception sociology”. Had you told me you had read Plato yourself and accord these sources some credibility because they encapsulate conclusions you had reached yourself, we can discuss what you read and how you read it. The Republic was in my hands, although admittedly a very long time ago. Plato never made sense to me then, or after, until I had read Marimba Ani’s “Yurugu.” No doubt you could find extreme fault with me for that and all sorts of sins through my experiences negotiating the Western world and I’ll accept your characterization “blunder” on that world’s behalf, after-all they make the rules for the rest of us. 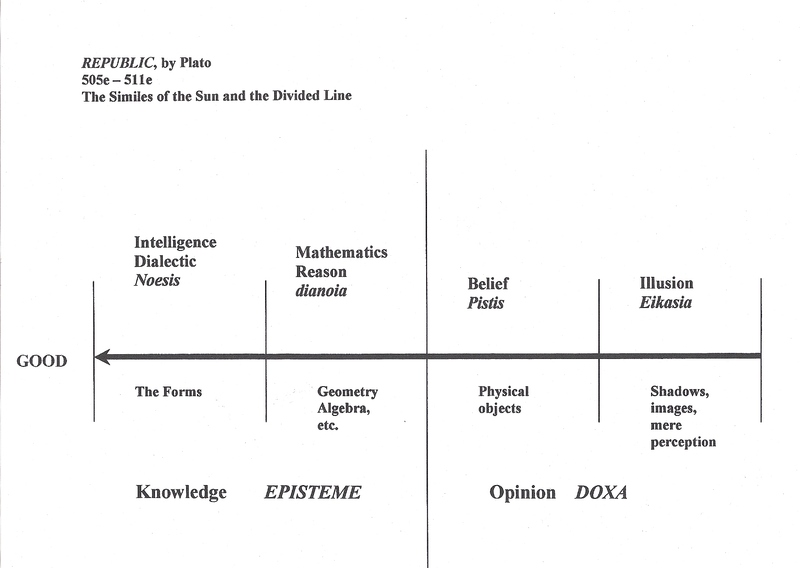 ^ For example I’ve also been criticized for using this illustration as example of a misapprehension of reality, characterized as a misinterpretation of Plato’s thinking but it wouldn’t matter what illustration I’d used, someone in the ‘world of Plato’ could find fault with it. Perhaps what should matter is there are people who see a phenomenal world the Western people cannot and whether there were ability to grasp the idea (on the Western side) there is reality whose details are understood by the one (non-Western) culture and by the other (Western) culture, not. “Plato never made sense to me then, or after,…” — Ok, that is a fair start. At this point, I can only deal with your own logic. If Plato never made sense to you, you cannot stamp him with the “western” category. Therefore, you cannot know that “Perhaps what should matter is there are people who see a phenomenal world the Western people cannot …” applies to Plato. If your current (apparent) logic of assuming that it does apply to Plato does not bother you, no problem. I am not a missionary because I am not a fan of fools’ errands. If it does, we can work it through. Or you can take the time — I am in no hurry — to work through the little article I sent you. Perhaps you will see what “western” scholars, a subset of “western people”, do not see. — I do not “tell” people what Plato says, on or below the so-called “surface.” It is a matter of seeing. Of course, it is also a matter of “giving an account” of what is supposedly seen, which is “logos” in Greek. Methinks you’re ‘making the rules’ (a favorite habit of European mentality, includes transplanted thought modes via colonialism found throughout the world) for the rest of us (certain non-linear indigenous thinkers.) But I should be lenient here; if you cannot know ‘our’ rules, either we’re stuck with ‘your’ rules or you will have to climb down and learn a different set of rules. So, what? We flip a coin? Whose rules?